Submitted by Norm Roulet on Fri, 01/29/2010 - 03:59. I've been thinking lead poisoning victims should send letters containing lead dust samples to the homes of people who clearly don't consider lead poisoning a serious matter. What do you think? Anything wrong with sending a perfectly legal substance that is spewed upon the public by Mittal and Cleveland Thermal to the families of the CEOs of the companies and enterprises that buy dirty power and steel from them? How about sending lead to the politicians who vote for dirty coal burning, like the Cleveland City Council members who voted for AMP? I mean, it's not a big deal, right.... it's mostly nice clean steam coming out of those stacks attached to coal furnaces right in downtown Cleveland... right?!?! Steam and a bunch of minerals. Well, the public should share their mineral wealth right back. Perhaps we should include with the lead samples some informational literature about the harm actually caused to humans by small amounts of lead. Then, the CEOs would realize lead is more important than anthrax - and a better market opportunity - and develop a lead vaccine. Right... we don't need a vaccine... we just need to stop polluting and get the lead out! I know 100,000s of homes in Northeast Ohio in which to find lead, so it is free and readily available, if any CEOs want tons. Should the people send their lead to their leaders who do not care about the environment? Good or bad idea? Submitted by Norm Roulet on Fri, 01/29/2010 - 04:48. If pollution were recognized as a lethal weapon, would the politicians, suburbanites, judges and police help protect citizens from Mittal, and help clean up our toxic blight? Submitted by ljhg on Fri, 01/29/2010 - 16:49. Would it be a crime... in Gates Mills? Submitted by Norm Roulet on Fri, 01/29/2010 - 07:34. Would it be a crime to move lead contaminated dirt from a public park in Tremont to a public park in Gates Mills? Would leaders in Gates Mills leave the lead in the park if they knew? Would the parents of Gates Mills let their children near the lead contaminated dirt... would they go near it themselves? Would it be the parents of Gates Mills' dirt to clean up, or the community's dirt to clean up, and how large a community... how fast would these powerful people have this site be declared a superfund site receiving federal funds for cleanup? Would a citizen be charged with a crime, for moving dirt from a public park in a poor, contaminated place to a public park in a rich clean place? What if the dirt was moved from a dirty Cleveland school to a clean suburban school - would that be bioterrorism? Would rich parents allow their children to go to school of they knew it was lead-contaminated? Would rich parents be responsible to clean-up the mess, or would the community? How large a community? Wouldn't state and federal dollars be spent? Submitted by noner on Fri, 01/29/2010 - 10:53.
name the names - which council members voted for AMP? Submitted by sandy smith on Fri, 01/29/2010 - 11:27. Only Mike Polensek and Brian Cummins voted against the AMP deal. Submitted by Jeff Buster on Fri, 01/29/2010 - 11:48. You can read about the night of the Counsel vote here on Realneo. Now Mr. Santiago is out of office. Lehman Brothers was one of the prime proposed funders for the AMP OHIO project. The failure of Lehman is the main reason the project has been stopped - IMHO. Maybe having short term Counsel persons voting on 50 year contracts isn't a smart idea? 50 year coal supply contracts with MUNICIPALITIES (who can't easily file bankruptcy) - pushed ahead of climate change legislation by the coal lobby - are the prime motivation behind AMP and other coal fired power proposals across the US. Zack Reed was also against AMP, but explained that the way Mr. Sweeney had set up the legislation, the vote on the night in the link above was purely ceremony - what was needed was a withdrawal vote. Submitted by Norm Roulet on Fri, 01/29/2010 - 14:04. 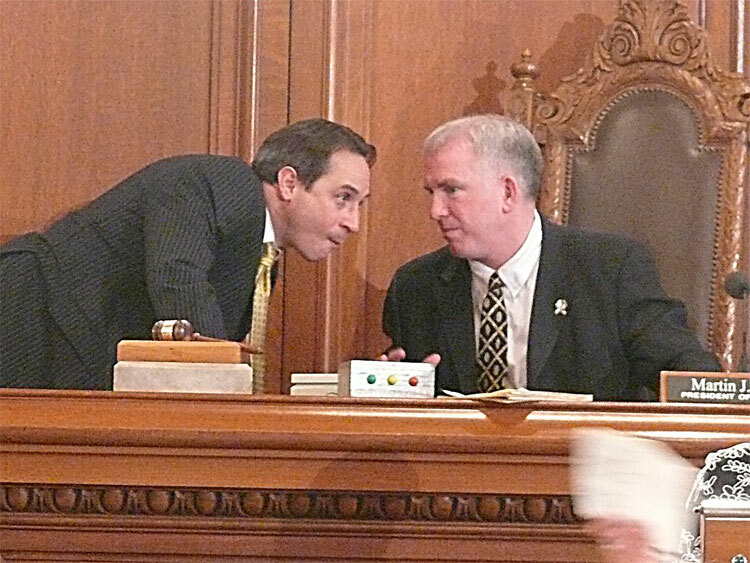 Mike Polensek and Brian Cummins deserve to be spared further lead poisoning... we need them and their better-working brains around realNEO, keeping control of the other council members who vote to pollute and kill. Submitted by westward on Fri, 01/29/2010 - 17:11. Since the vote was ceremonial, and a dog and pony show ensued, I can't get all happy about representatives who play to an audience because the vote doesn't change a thing. Both were present 10/31/07 and both voted for the ordinance that got us here today. However, I could get happy if one, both, or anyone in council, originated legislation that would end this contract. You know the saying, contracts are written to be broken. Submitted by sandy smith on Fri, 01/29/2010 - 12:03. I explained to Joe Santiago, at length, about the facility and discussed the length of the contract with him before the vote. We spoke for about 45 minutes. If he was listening, then he knew EXACTLY what that facility was all about. He told me that he thought the contract was what was best for the city. When I mentioned the long-term repercussions of a 50-year contract, he was dismissive and ended the conversation. Submitted by skd0333 on Fri, 01/29/2010 - 12:41. I also spoke to Santiago asking him not to vote for this bill. He did explain, as Zack Reed has said, it was difficult to vote against. I was perplexed by that and the next thing I know, it's a done deal. To bad AMP didn't go through. Submitted by fetus1990 on Sat, 01/30/2010 - 15:53. Anyone who voted to kill the AMP plant is a FOOL!!! AMP would've been one of the cleanest power plants in the country, using Powerspan's multi-pollutant control technology. It could've displaced older, inefficient plants. Powerspan technology would've controlled SO2, NOx, HAPs, Heavy metals and the very toxic, extremely dangerous...CO2. Submitted by Norm Roulet on Sat, 01/30/2010 - 17:15. You are doing a poor job. We could always go back to the 1500's. Submitted by fetus1990 on Sun, 01/31/2010 - 15:55. What is your idea of pollution, or better yet, no pollution? At what point would industry be OK to operate in utopia? Based on your response, I have to assume you didn't review the multi-polluntant control technology proposed by Powerspan in the AMP Ohio coal burning facility. I'm certain, if you generate an acceptible standard to society (business included) w/out destroying the world economy, or so all players are guided by the same rules, then industry would evolve to meet the standards. FETUS 4 COAL - (great handle by the way!) FEE TUS! Submitted by Jeff Buster on Sun, 01/31/2010 - 22:39. "Our patented Electro-Catalytic Oxidation (ECO®) technology provides high removal of sulfur dioxide (SO2), nitrogen oxides (NOx), oxidized mercury, and fine particulate matter (PM2.5) from coal-fired power plants. Our ECO2 carbon capture technology is designed as an add-on system that can be deployed when needed. Currently, we are involved in a number of utility projects including the pilot testing of our carbon capture technology, commercial scale demonstrations, as well as full commercial installations." Question: Where are the "full commercial installations"? And another question, what do they do with the SO2, Nox, mercury and fly ash? (I have an old mine shaft to fill). Another Question: why do coal fired power plants still have tall chimneys since the only discharge is warm moist air? And don't forget - "only a FOOL would be ANTI-AMP"
Submitted by fetus1990 on Sun, 01/31/2010 - 23:18. Very good question. No commercial installations currently exist for the Powerspan technology. I'm sure its just expensive...or pollitically incorrect to burn coal, even when it involves clean coal technology....JUST PLAN IGNORANT!!!! The first full scale ECO project was the AMP Plant...Scratched!!! BY FOOLS!!!! Tall stacks question. It involved disperssion modeling back in the 70's to eliminate localized sulfur impacts from burning high sulfur, uncontrolled coal. Today, the height of stacks are required to keep the cooler, dense plume from contact. The plume when it exits the stacks has about 5-6% oxygen content, 10-12% Carbon dioxide, ~15% water vapor, and 72-75% nitrogen. Pretty scary stuff huh? Eventually the same knuckleheads will regulate nitrogen, or claim it's responsible for increased algal blooms...oh crap, it already does? And fetus is not just for coal, but I'm for anything that combusts and has potential to provide productivity in our industries. Or maybe the world would be better if all sources of energy were halted. The AMP Plant...Scratched!! BY FOOLS!!!! Submitted by Charles Frost on Sun, 01/31/2010 - 23:27. Yea, by the people who were building it. ...so the AMP Ohio folks are fools for not wanting to loose money????? Warn me not to invest in any company you recommend!!! An unexpected 37 percent increase in the project cost has led American Municipal Power Inc. to pull the plug on its proposed $3 billion coal-fired power plant in southern Ohio. The Columbus-based nonprofit power supplier said Wednesday it will instead explore developing a natural gas-fired power facility, buying power on the open market and pursuing advanced energy technologies to serve its members. The decision came Tuesday after AMP learned the cost to build the coal-fired plant would increase by more than a third, said AMP spokesman Kent Carson. Part of the reason for the big price jump, he said, appears to be an increase in the cost of installing the newer ammonia-scrubbing pollution-control equipment that was to be used at the plant. Some 81 AMP member communities in Ohio, Michigan, Virginia and West Virginia are participants in the power plant project. It has been under development for six years at a site near Letart Falls in Meigs County along the Ohio River. The project has been criticized by a number of environmental groups that claimed it would not use the latest clean-coal technology and AMP should pursue other options. But that criticism was not a factor in the decision to halt the project and explore other ways to provide the electric power, AMP CEO Marc Gerken said in a release. Carson said AMP will consider using the site in Meigs County for the revised project. That would allow it to benefit from the development work already performed there. But other sites will be examined as well. AMP has always said it would halt the Meigs County project if the economics of it did not favor its members, Carson said, adding that is what happened when the project cost soared. He also said AMP remains committed to developing five hydroelectric plants along the Ohio River. It is also interested in whatever opportunities might arise on other forms of advanced energy such as solar, wind and landfill biogas, he said. I thought Clean was worth the cost? Submitted by fetus1990 on Sun, 01/31/2010 - 23:40. Whoa...I thought money was no issue for a cleaner environment. AMP is a municipality. Why is it OK for a government group to claim a project is to expensive but when a private industry aborts a project that's better for the environment, they're demonized? The seems like a pretty severe double standard. Was it the fact that the municipalities and voters w/in them would've seen a drastic increase in their electric rates? Heck yeah it is!!! Is that any different than increased utility bills driven by global warming legislation? Seems the same to me, but I like to analyze things from all angles. "We have to wake up some people who are asleep,"
Submitted by Charles Frost on Mon, 02/01/2010 - 00:08. The financial well dried up for the antique coal burning technology. A "drastic increase in their electric rates?" had nothing to do with it!!! Three of Wall Street's biggest investment banks are set to announce today that they are imposing new environmental standards that will make it harder for companies to get financing to build coal-fired power plants in the U.S. The move shows Wall Street is the latest U.S. business sector that sees some kind of government emissions-capping as inevitable. But it shows disagreement about what to do. It also marks the latest obstacle to coal, which provides about half of U.S. electricity but emits large amounts of CO2. Citing costs, the U.S. government last week pulled support for a project called FutureGen that many utilities saw as a step toward burning coal cleanly. The standards, which would apply to all but the smallest plants, result from nine months of negotiations among the three banks and some of the biggest U.S. utilities and environmental groups. The standards could hurt coal-dependent utilities that haven't begun factoring a future price of CO2 emissions into their planning. But they could help utilities that have. The banks say they don't want to be involved with debt that goes bad as a result of government emissions caps that require the power plants they finance to buy large numbers of extra pollution allowances. Under a cap-and-trade system to limit greenhouse-gas emissions, the government would distribute a certain number of emission allowances each year. Companies whose emissions exceeded their allowances would have to buy more from companies that had more than needed. Congress is considering several cap-and-trade proposals. "We have to wake up some people who are asleep," says Jeffrey Holzschuh, vice chairman of institutional securities at Morgan Stanley. The banks are likely to continue to finance certain coal-fired power plants: those designed to capture greenhouse-gas emissions and shoot them underground if that technology became practical. But they make it less likely the banks will finance other coal-fired plants. Several dozen are on the drawing board in the U.S., many not yet financed. The standards follow TXU Corp.'s proposal to build 11 coal-fired power plants in Texas -- a plan it scaled back to three last year. TXU was later taken private by a group led by Kohlberg Kravis Roberts & Co. and TPG, formerly Texas Pacific Group. Citi, J.P. Morgan and Morgan Stanley -- top financiers to the U.S. power industry -- were among the banks that advised the buyers. The banks are under pressure from environmental groups but say their bigger motive is financial. Most major presidential candidates favor legislation to limit emissions. "What is earth-shakingly different between now and two years ago is the focus on CO2," says Eric Fornell, vice chairman of J.P. Morgan's natural-resources banking division. Several states have begun requiring utilities to account for the potential cost of emissions in new-plant plans. The banks say they will encourage energy-efficiency and renewable-energy pushes before backing new coal plants. And they say they will help utilities push for new government policies that make efficiency programs and renewable energy more practical. Submitted by fetus1990 on Mon, 02/01/2010 - 21:22. Two years ago banks a vauled resource for investments. Two years ago the global warming movement was full tilt gaining support daily. Two years ago the Glaciers were going to melt in 35years. Two years ago all global warming data was blessed as peer reviewed and accepted by all scientists. Today, none of the previous claims are true. Things have changed over the past two years. The public is sceptical and concerned we are rushing into fixing a globe that is warming. And we have no way of measuring how successful we are is stopping the globe from continuing its natural cycle. At least I'm using current arguments. Ever wonder what is growing at the Old Brunswick Florist building on Carnegie Avenue?